The history of the “Stammhaus – since 1897” is closely connected to the bookseller and music dealer Pieter Hendrik Verbeek. On 3 September 1894, P.H. 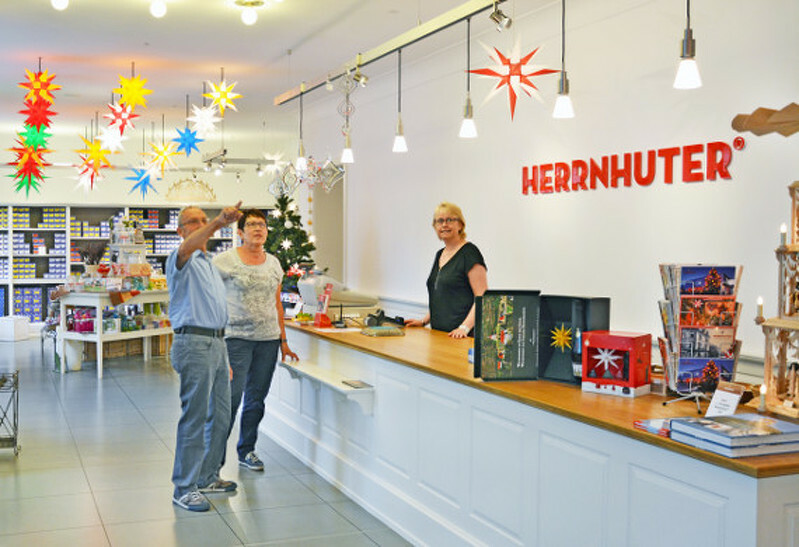 Verbeek opened a “book, art and music shop” in the Winter House in Herrnhut and simultaneously had today’s “Stammhaus” of Herrnhuter Sterne GmbH built in 1894-1895. The company moved into its new “Stammhaus” in 1895, where Herrnhuter Sterne have been sold since 1897. 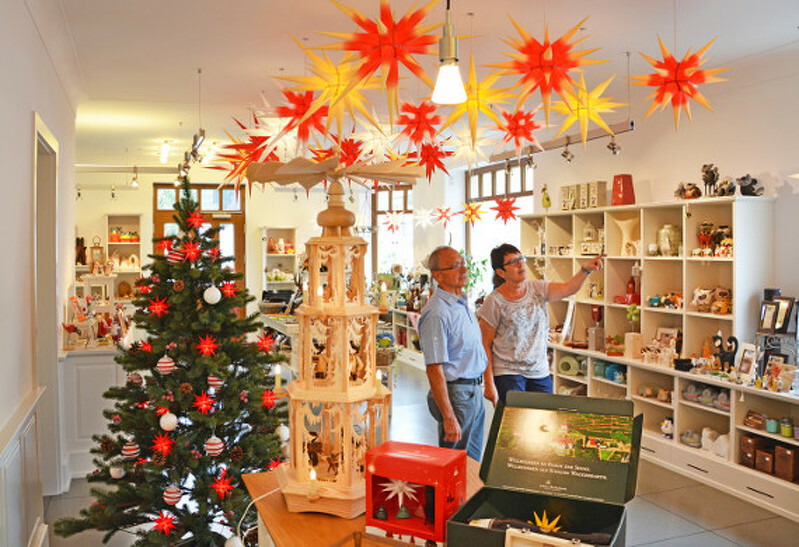 The “Stammhaus” of Herrnhuter Sterne GmbH combines a historical setting with a traditional handicraft. 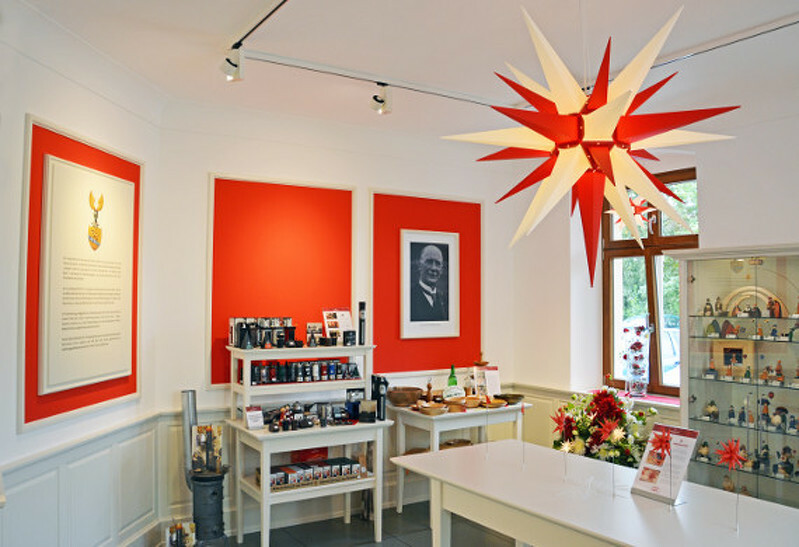 Since 1897, it has been possible to purchase Herrnhuter Sterne at the “Stammhaus” where a new design and concept now bring together tradition and the modern age. 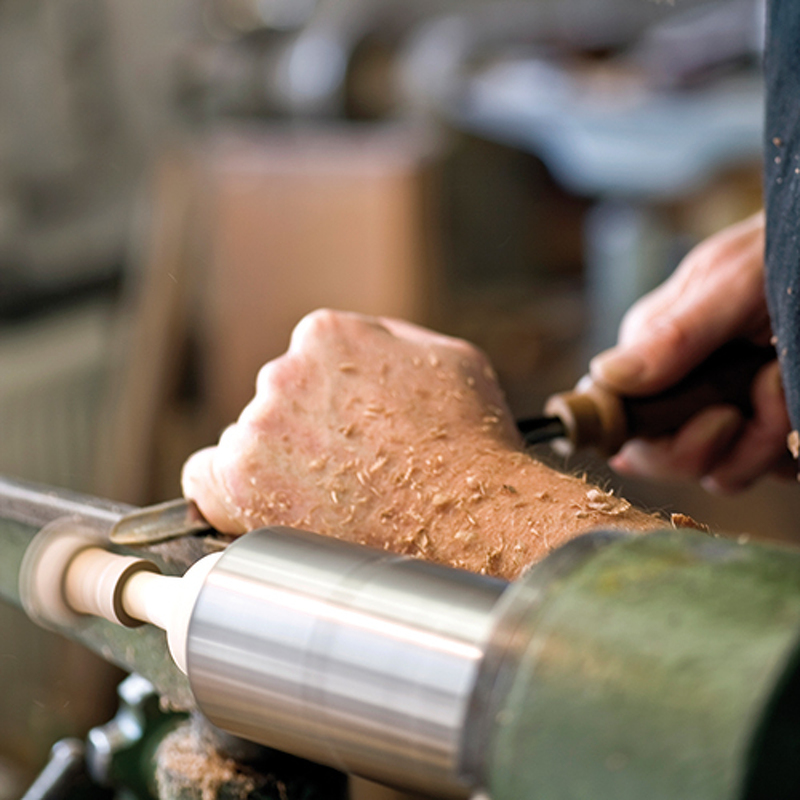 The newly created “Werk Raum” shop area stands for exclusivity and quality and represents craftsmanship in its purest form – created by select manufactories. 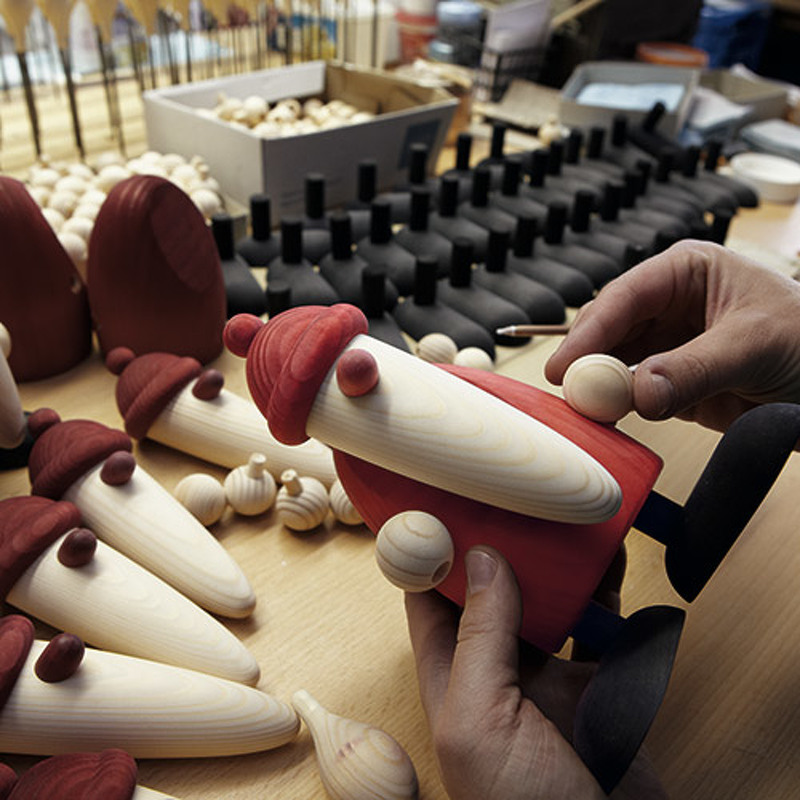 By concentrating on the essence of things and staying full of curiosity whilst inventing his own world is how Björn Köhler, working in small, handcrafted series, creates those cute wooden figures which have made this manufactory famous beyond the borders of Germany’s Ore Mountains. 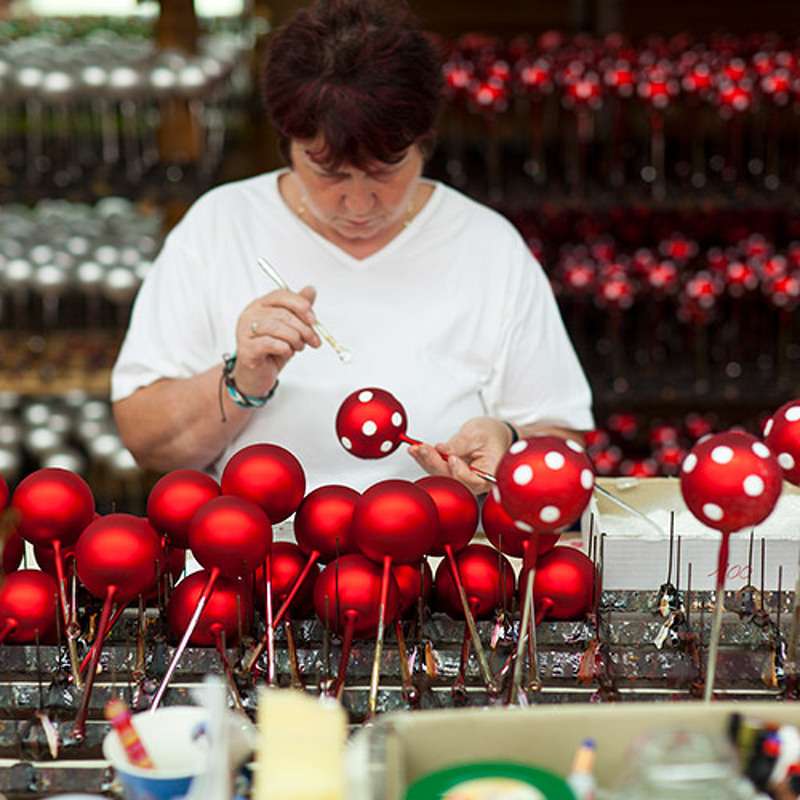 Whether a merry Father Christmas, impish elves or nativity figurines, they all achieve their final form only through the work of many hands, and are marked by masterful workmanship, as well as a great love of detail. This is something that can be seen by the eyes and felt by the hands. 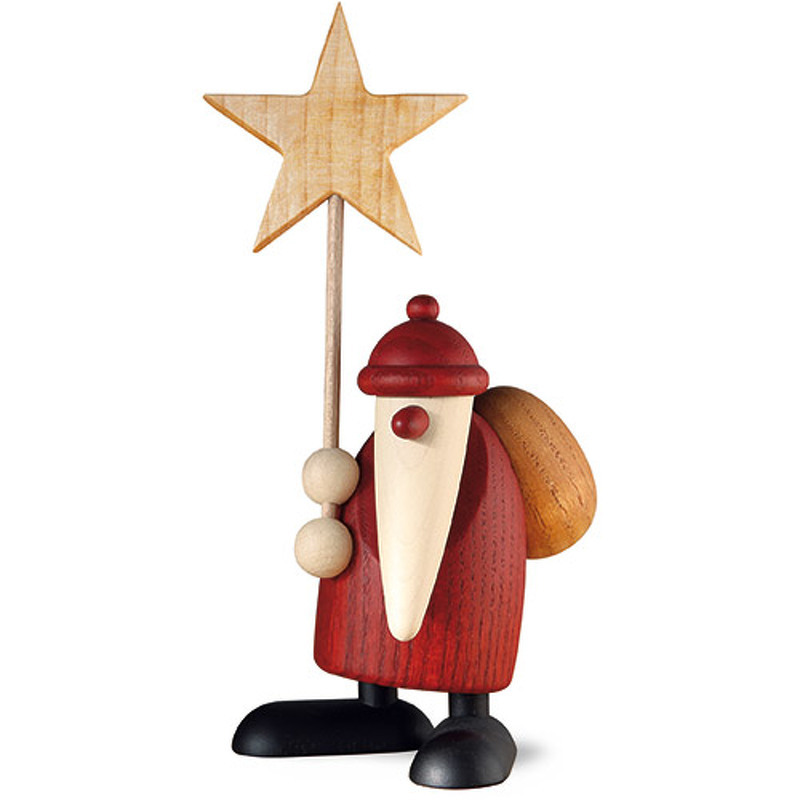 Thanks to their modern design and signature features, these little individuals differ considerably from the treasure trove of traditional Ore Mountains folk art, yet are still refreshingly conventional in their honest affirmation of artistic handicraft. 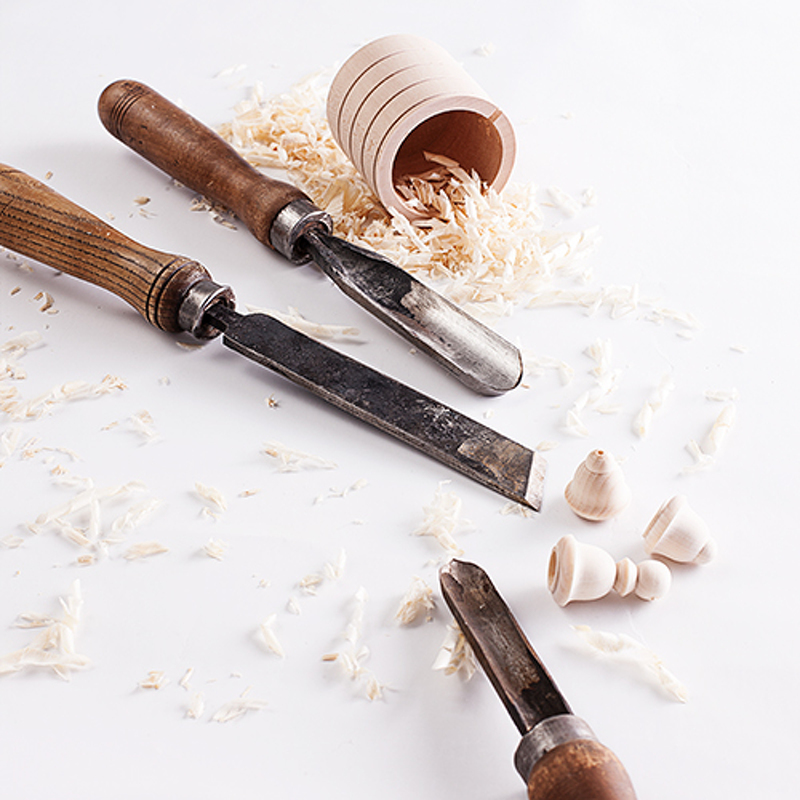 Since their designs are created on a manual lathe, no two are exactly the same, giving rise to individual characters which together nonetheless form an unmistakable ensemble. 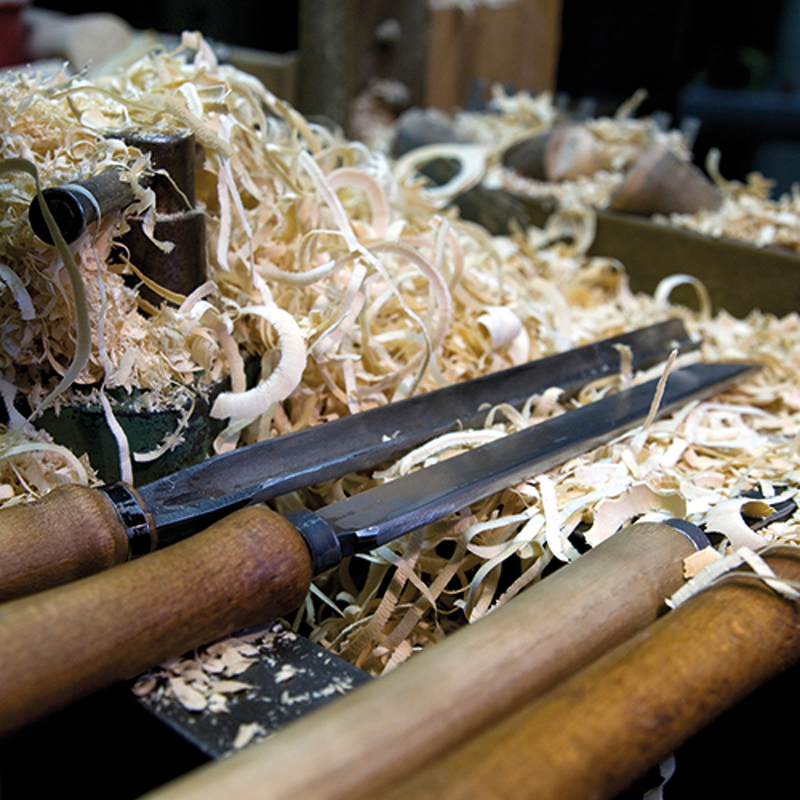 They are made largely of spruce wood. This type of wood demands a great deal of sensitivity from the turner, but the reward is a beautiful, expressive texture. 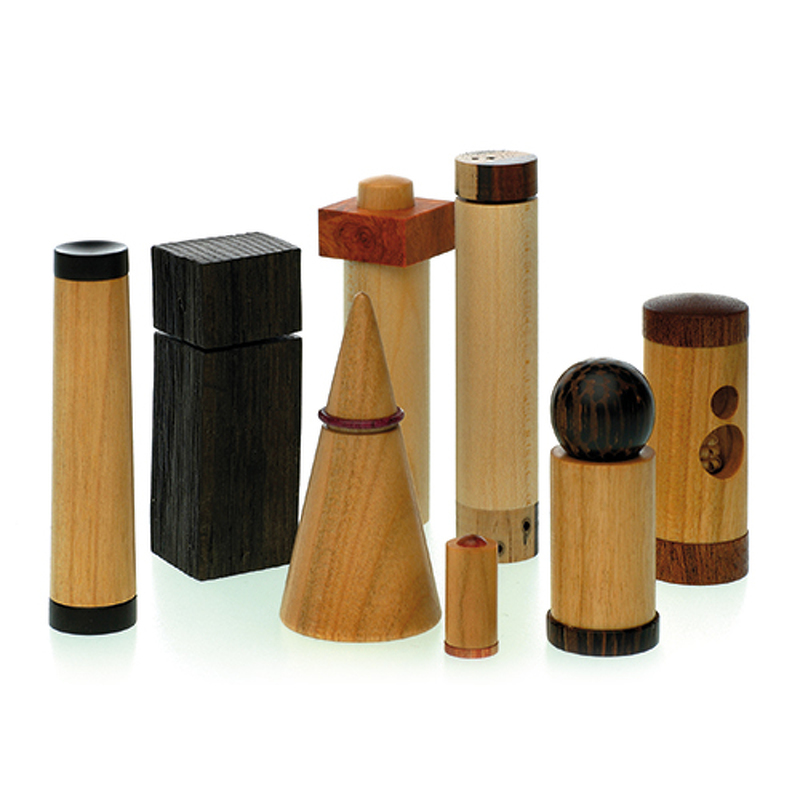 The texture is clearly visible in the little figurines, since their reductive form gets its life from the wood’s impressive grain. 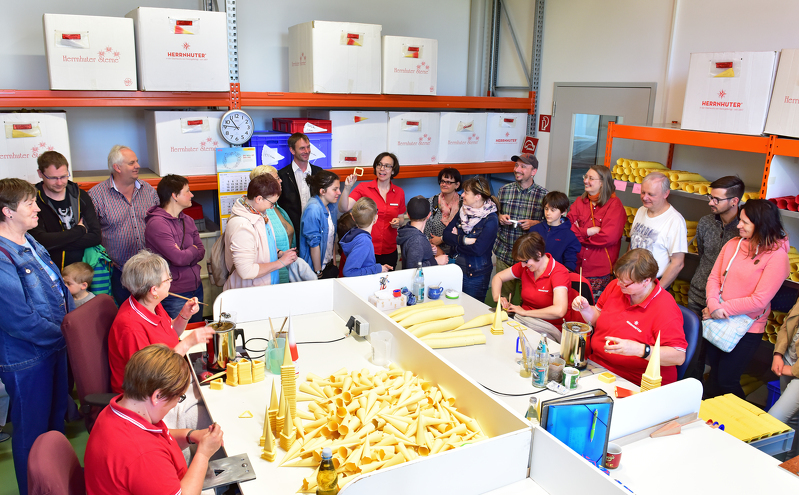 As early as 1930, the Huss company in Neudorf began making incense cones – those delicately scented cones from the Ore Mountains – made of natural materials and according to old family recipes. You might say these “Karzle” are unadulterated nature. 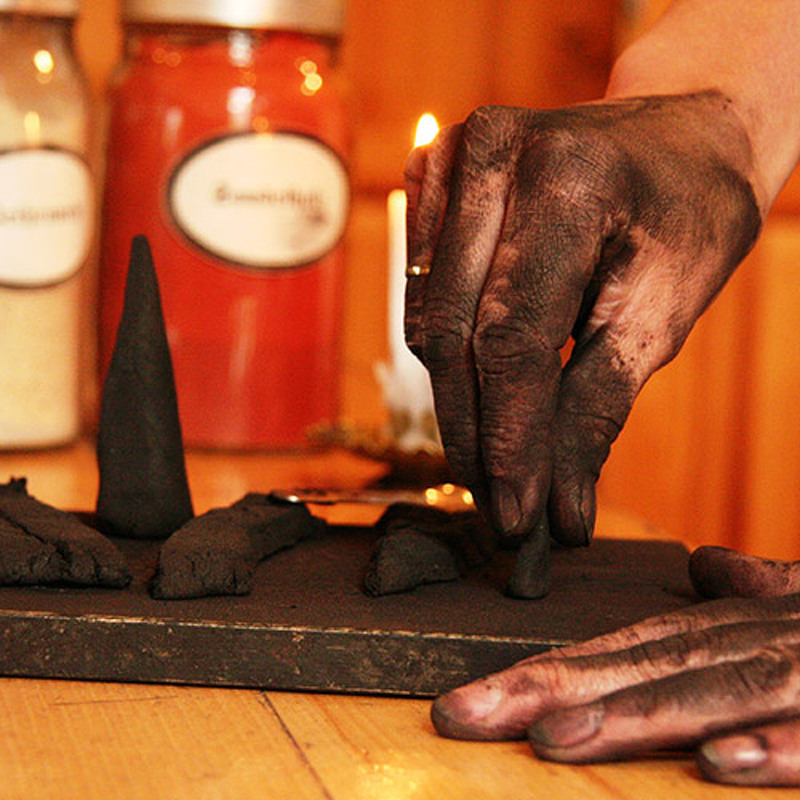 Back in the days of founder Kurt Huss, all good incense cones were “organic” and this outstanding quality has been upheld. 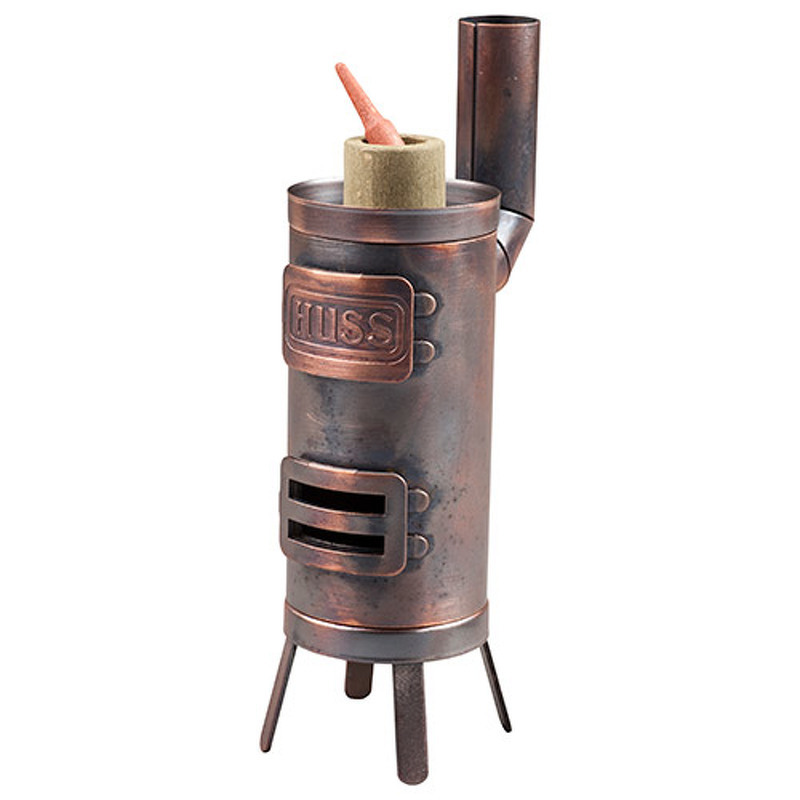 The superior Huss incense cones have dry materials such as resins, woods and specific spices to thank for their very special scent, which only unfolds completely as the cone burns down – a hallmark of incense cones. 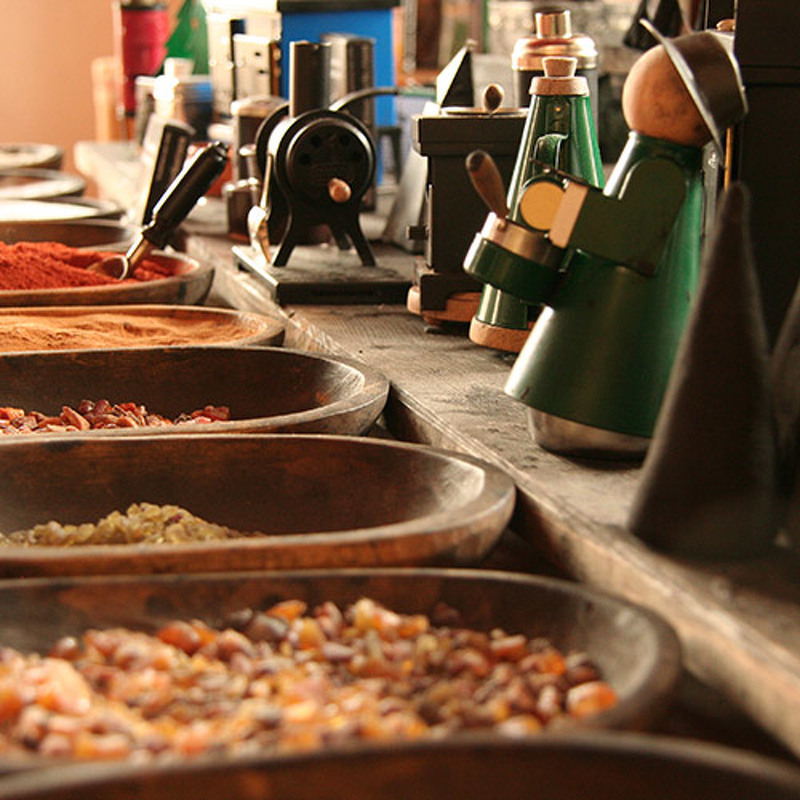 Apart from incense cones, the Ore Mountains-based company also produces various incense stoves and other vessels made of metal to warm the hearts of large numbers of people. In the mid-1990s, meticulously handcrafted miniature editions began to be made entirely of sheet steel, with a shape and workmanship that testify to high quality and a love of detail. Genuine traditional handicraft is a gift of joy! This is the guiding principle by which Klaus Müller-Blech directs the family enterprise INGE-GLAS, now in its fourteenth generation in the Bavarian town of Neustadt bei Coburg. 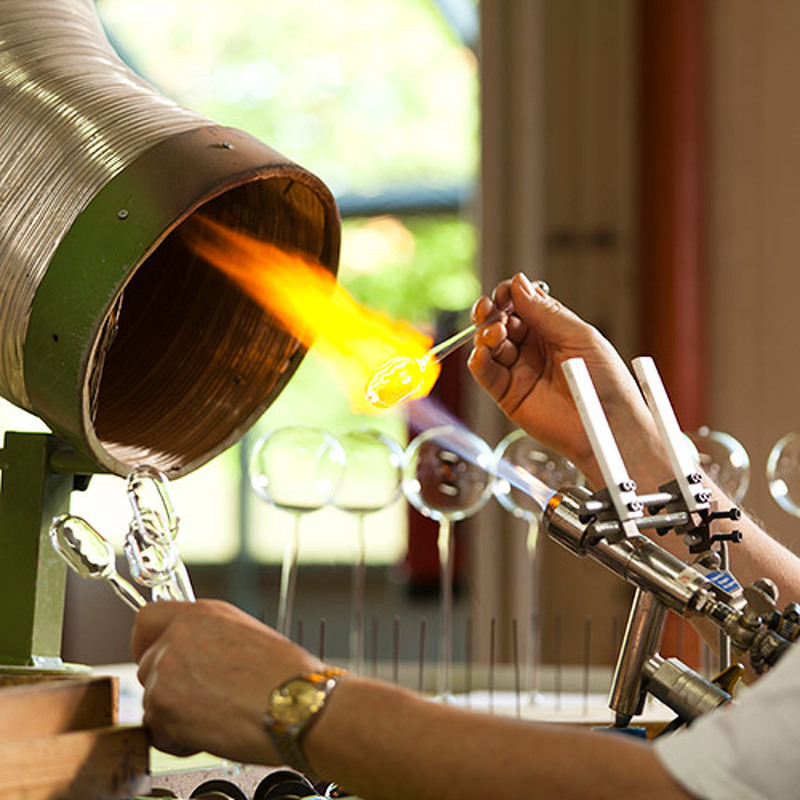 In the midst of the traditional German glass ornament producing region, unique glass ornaments and decorations are handcrafted by this company’s experienced glassblowers in the same way as they were more than 100 years ago. With a great love of detail, these are then painted by hand by skilled painters. It takes up to thirty stages of work to produce these unique, individually decorated, one-of-a-kind specimens. 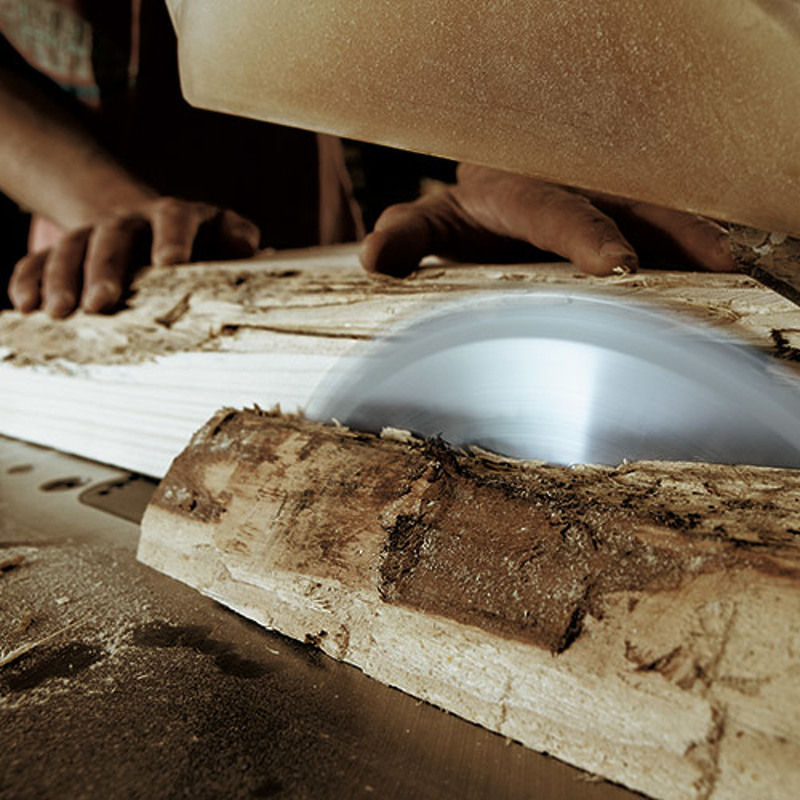 Only the best materials are used at INGE-Glas. 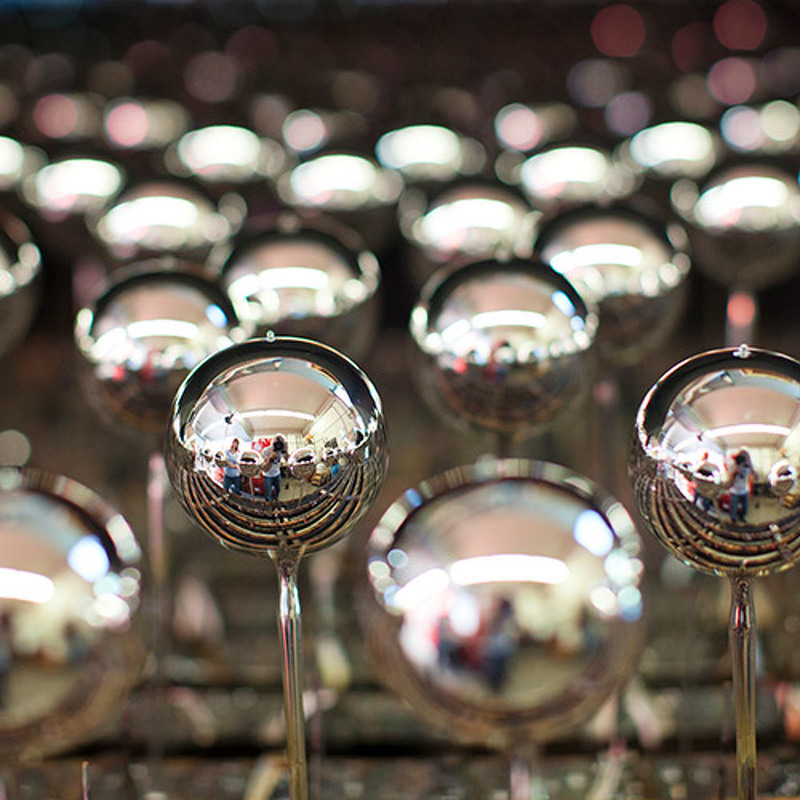 From clear crystal, elegant silver and brilliant colours up to glittering, high-value decorative materials, only select products are used to make these sparkling ornaments and Christmas baubles. 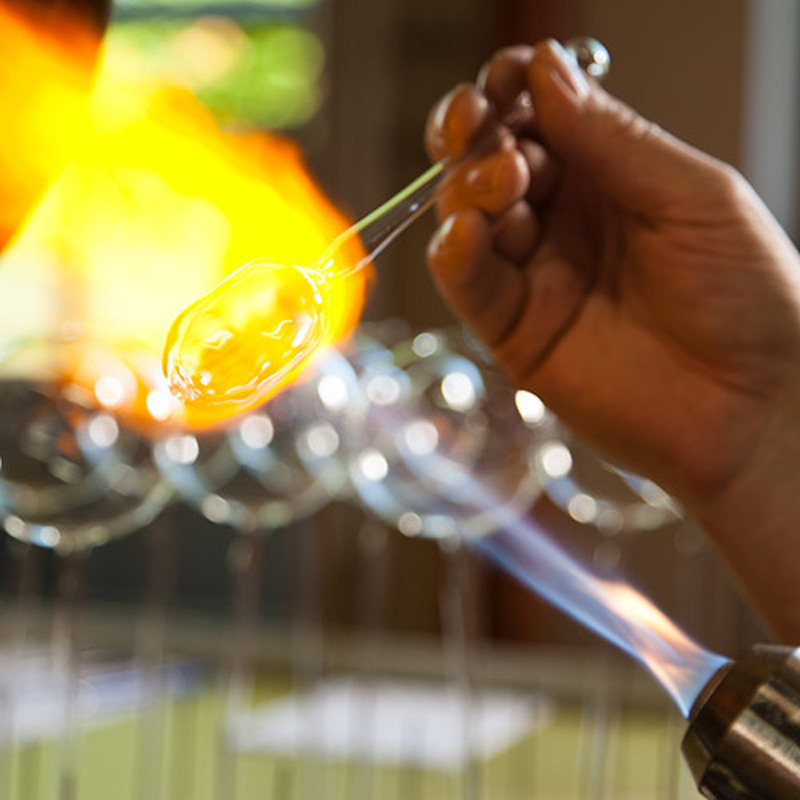 Thus INGE-GLAS manufactures magical, sparkling glass items year for year. 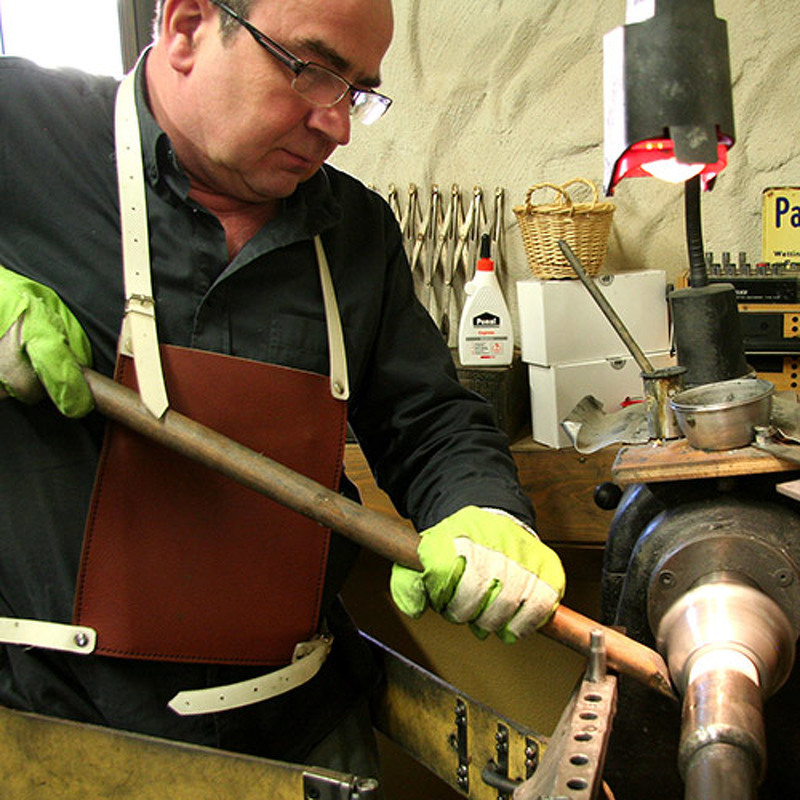 Oybin-based Kunstgewerbe Neufert is probably one of the smallest manufactories in Upper Lusatia, yet it has a charm all its own. 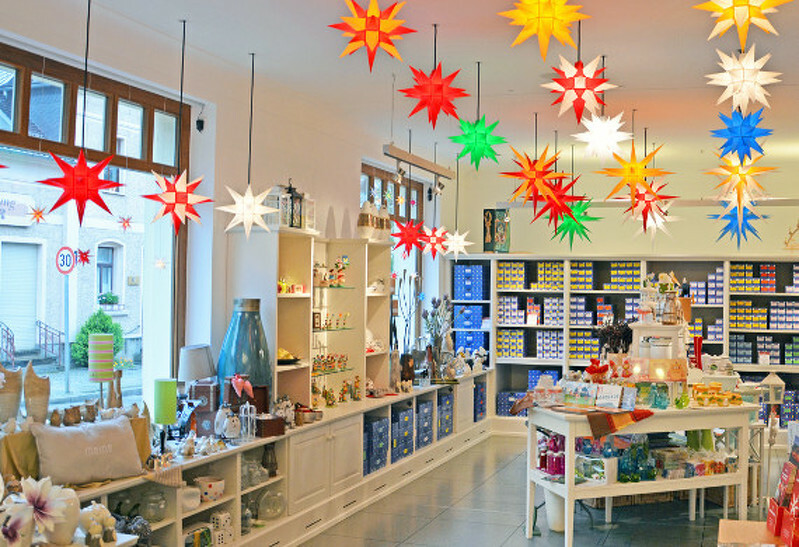 This traditional manufactory has been producing a wide variety of hand-made straw baubles and straw stars since 1973. 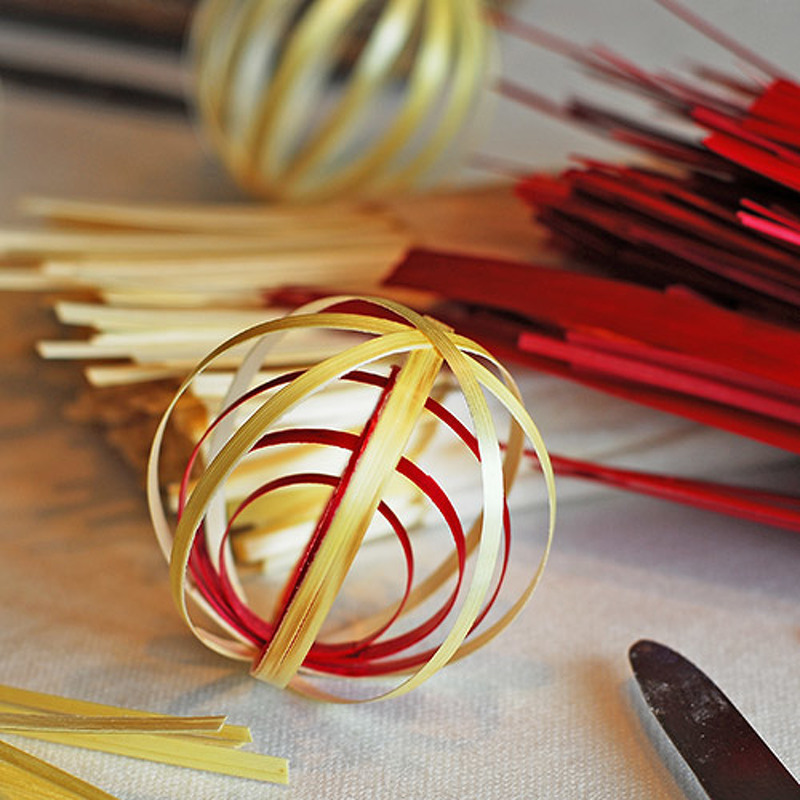 Carefully slit with a knife, smoothed several times over and cut to length, the straws are brought into shape and spliced one by one. 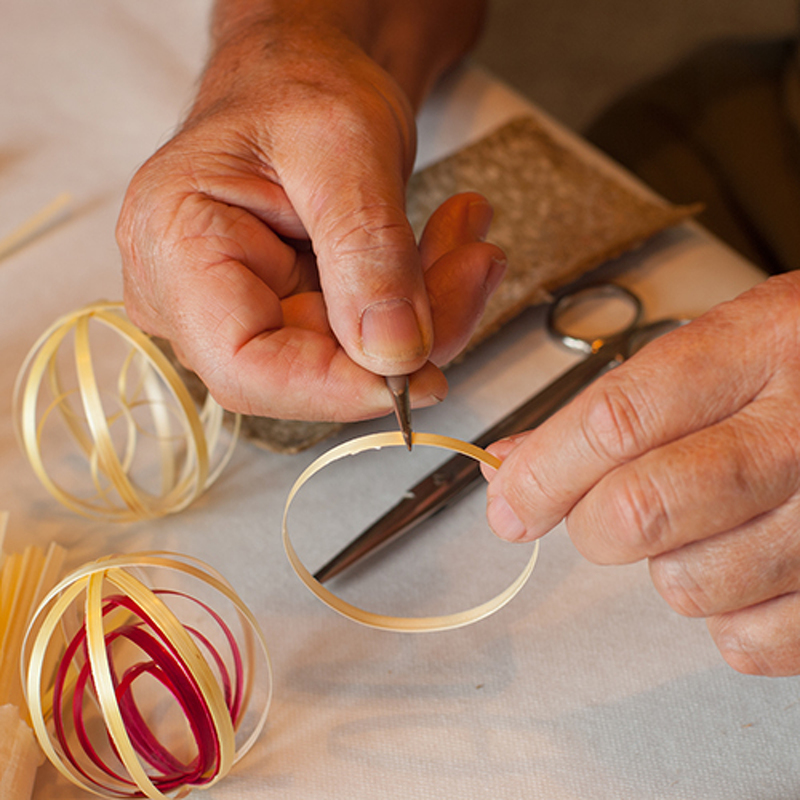 Up to twenty rings are deftly put together to form one straw bauble – a truly dexterous handicraft – and fifteen to twenty minutes are required to complete just one of these masterpieces. 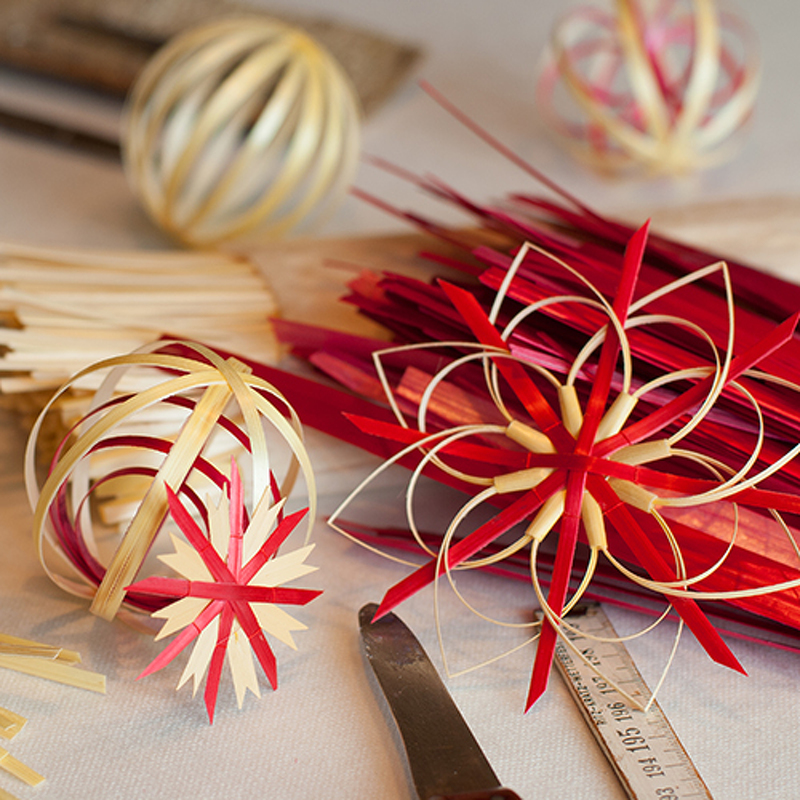 Straw stars augment the product range of the small manufactory – cutting patterns into individual straws by hand demands a fine sense of proportion, which underscores the uniqueness of each star. 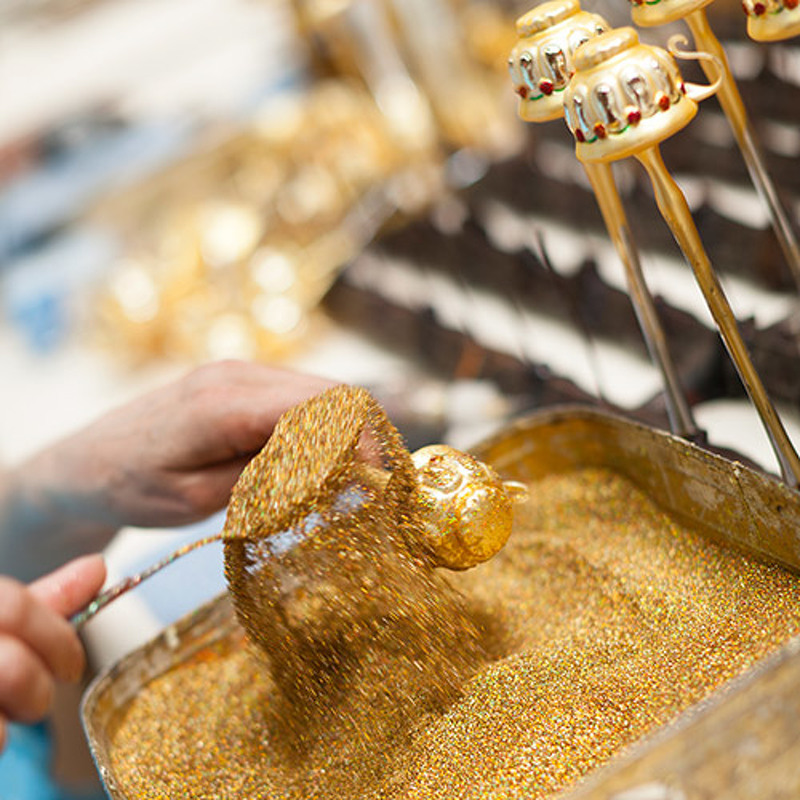 In this way, approximately four thousand individual items are made per year, and choosing from amongst the more than fifty different models is a difficult decision indeed – one which must be taken by the heart. The Vogtland, which was the centre of the German embroidery industry for more than 125 years, is the home of the head office of Stickerei Vogel. 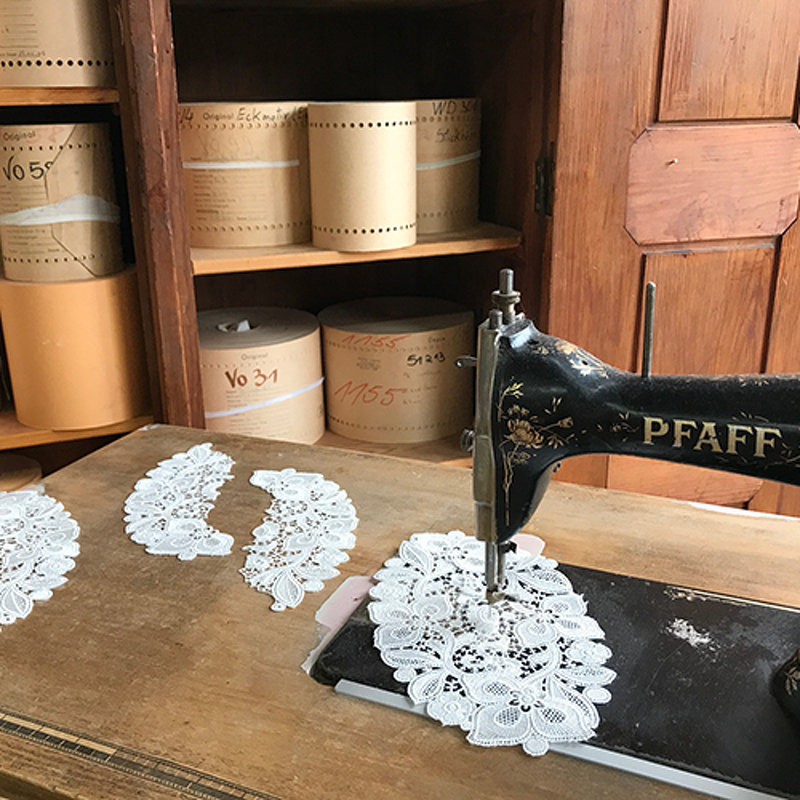 For five generations, this company has preserved and passed on the craft of making genuine Plauen lace. 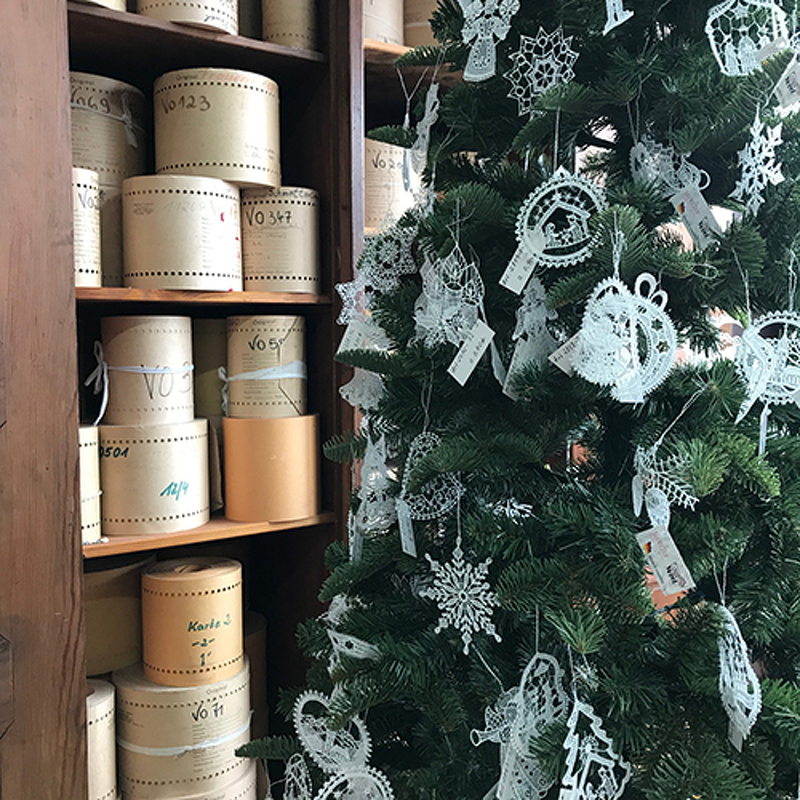 The collection includes not only high-quality embroidered table linen in classic as well as modern styles, but also traditional window decorations and guipure lace Christmas tree pendants, clothing fabrics, pillows and accessories. 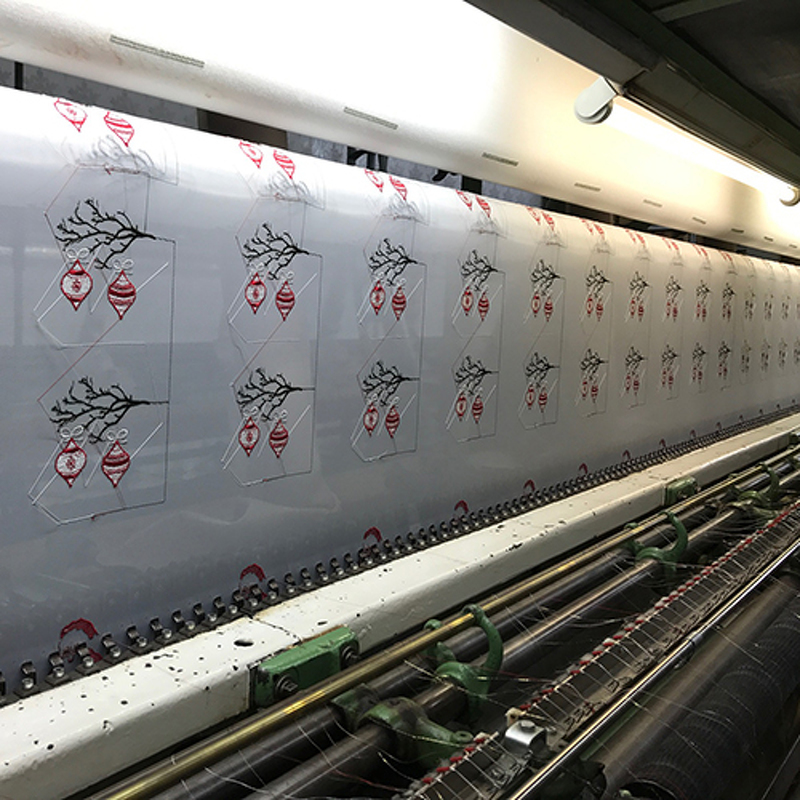 The product range is rounded off by bespoke small batch series of the finest workmanship, which are adapted to individual customer’s specifications. 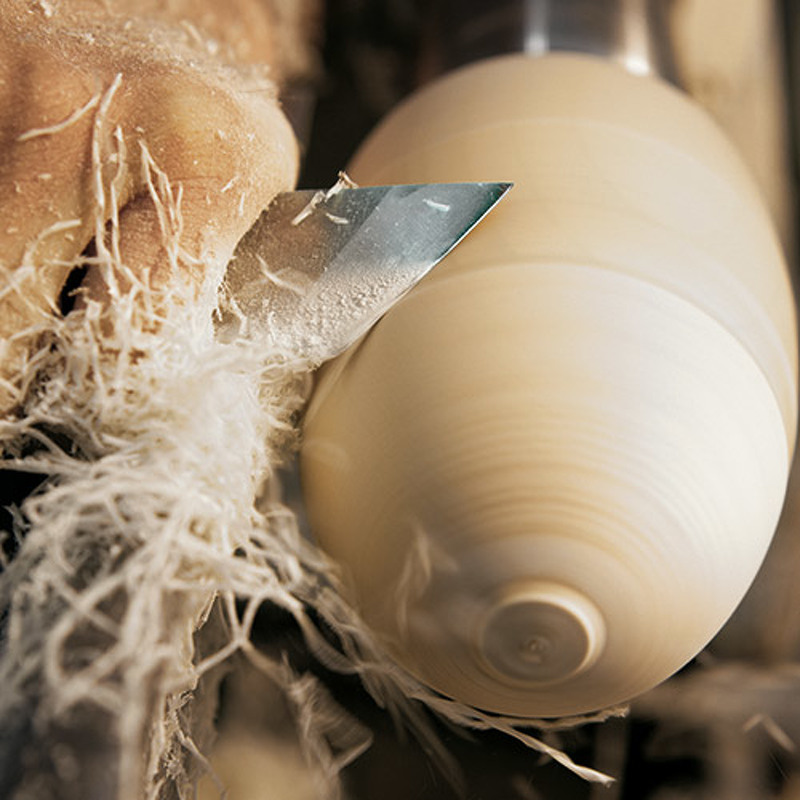 This keeps tradition and quality firmly at the fore despite the wide range of different products. With a keen eye for enhancing structure and fabric with an ornament made of genuine Plauen lace or reinterpreting the finest Plauen lace, Stickerei Vogel not only stands for traditional table linen, but also for modern design. Although some things may seem small and inconsequential, by scrutinising them closely we can appreciate their true grandeur. 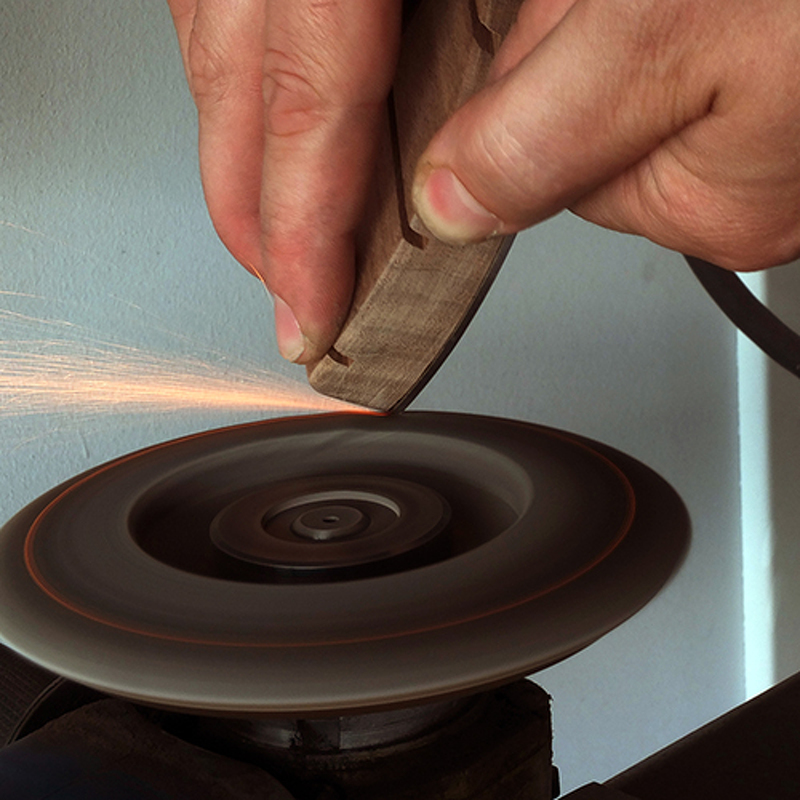 Following this principle, Uwe Uhlig creates unique products with a special character – always taking on the challenge of preserving traditional Ore Mountains handicraft whilst simultaneously giving it a modern interpretation. 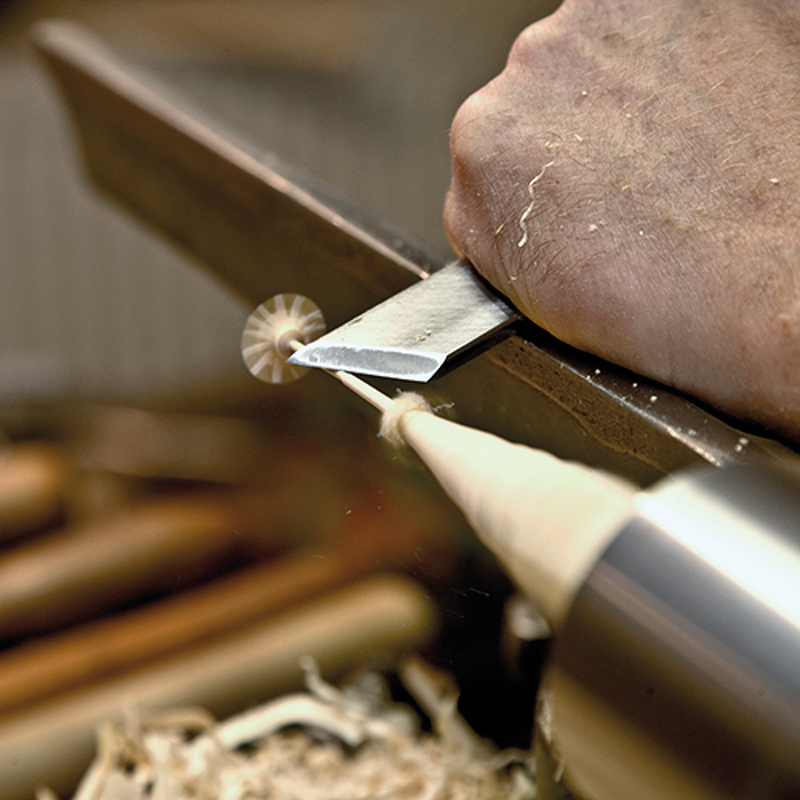 In this pursuit, he not only makes use of exotic types of wood, but also many domestic species of precious wood, such as cherry or ash, which can thus give the products a regional reference, as well as a distinctive charm. His work centres on fairy-tale motifs, but also includes innovative humorous ideas, such as a Christmas tree for the trouser pocket, or the Pocket Art series. These tiny products demand the greatest attention to make, as well as a high level of precision and outstanding artisanal skills, enabling us to discover amazing details which are not seen at first glance. Hence, with Miniaturendrechslerei Uhlig we leave the big world behind and delve into the intriguing world of the minuscule. At unoferrum, modern aesthetic design meets the highest quality. The strong sense of functionality displayed by this integrated design label based in Freital near Dresden has been clearly setting it apart from the competition since 2014. Alongside puristic home accessories, small pieces of furniture and lamps, the SILHOUETTE collection particularly stands out. The SILHOUETTE collection captivates thanks to its clear-cut design and high-quality materials, which are exclusively handcrafted. 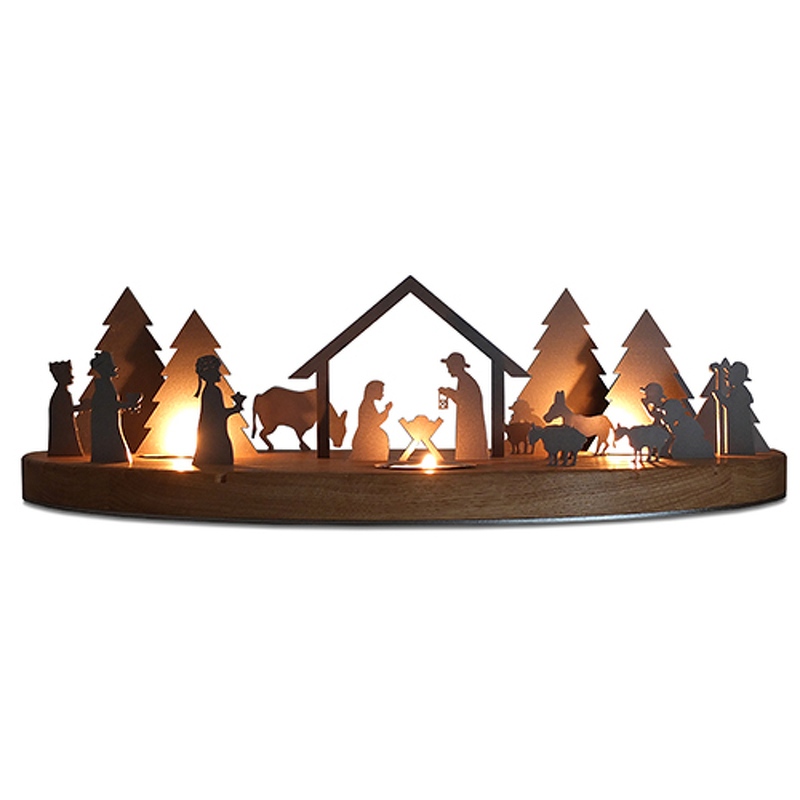 A semi-circular, solid wood base with grooves cut into it enables the precise, laser-cut figurines made of finely brushed stainless steel to be variously placed on it. 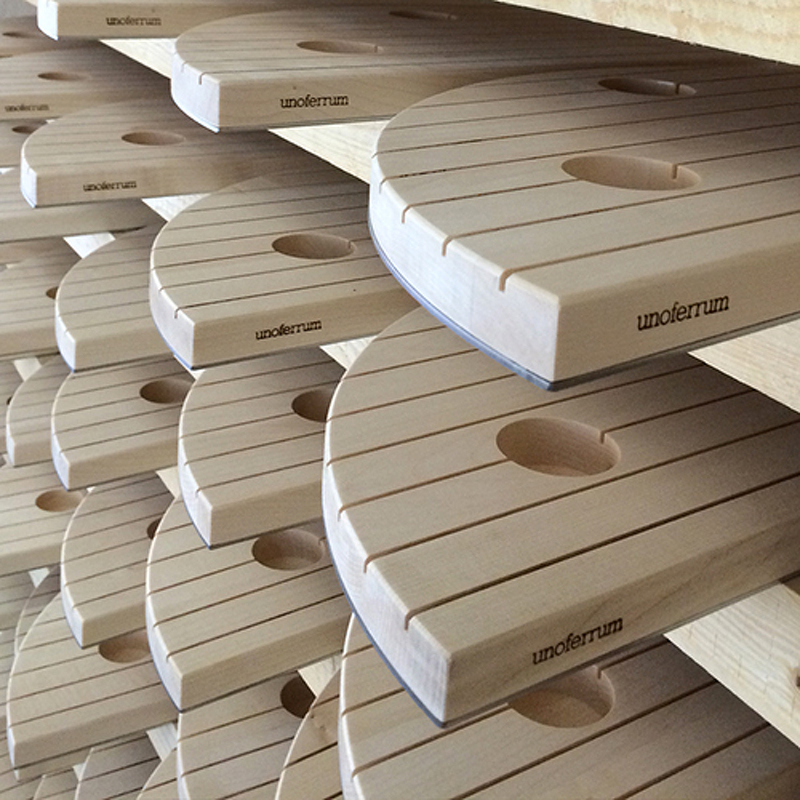 The base is a semi-circular wooden pedestal which is milled, smoothed and sealed with hard wax oil. 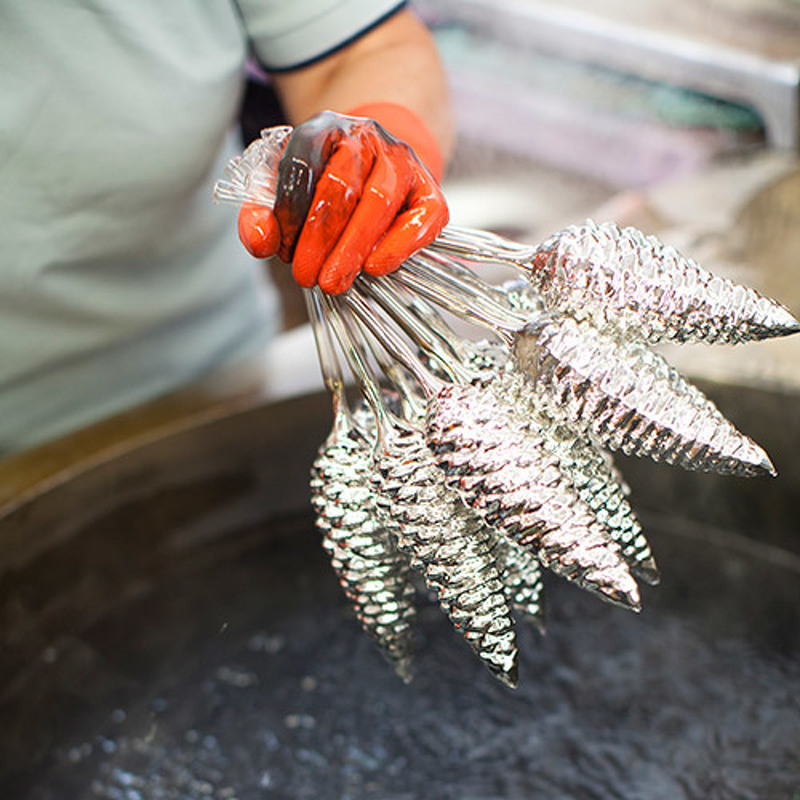 By the same token, the individual stainless steel figurines are ground by hand and provided with a nano-seal to protect against fingerprints. 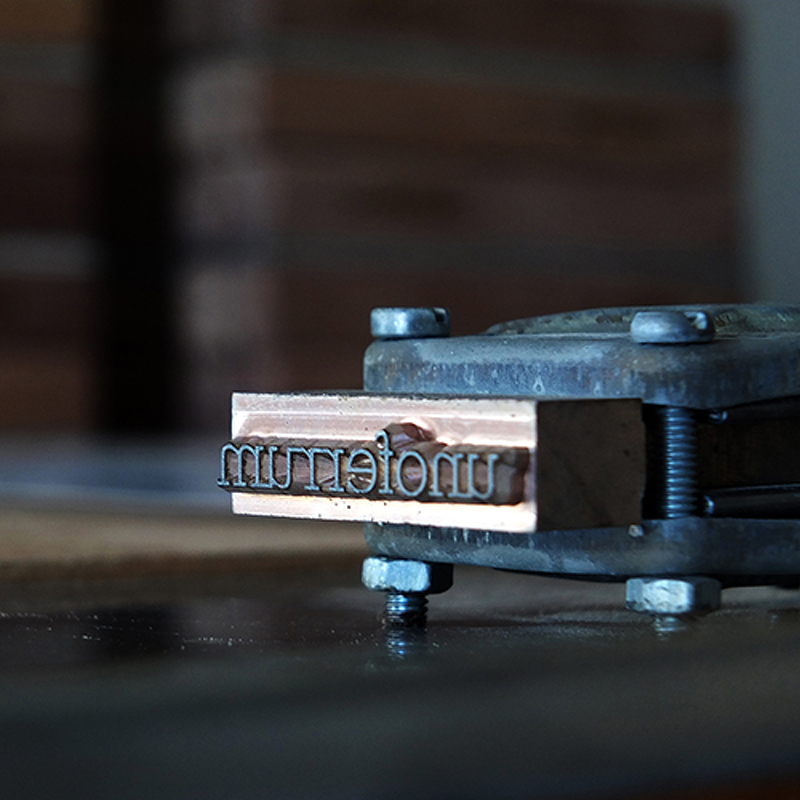 What makes unoferrum and its collection so unmistakable, however, is the bottom of the wooden pedestal. A magnetic component worked into the base means that the stainless steel figurines take up very little space when stored away. They are exclusive, of a timeless beauty, and designed to meet individual demands: the colourful figurines and music boxes from the long-established Wendt & Kühn manufactory. 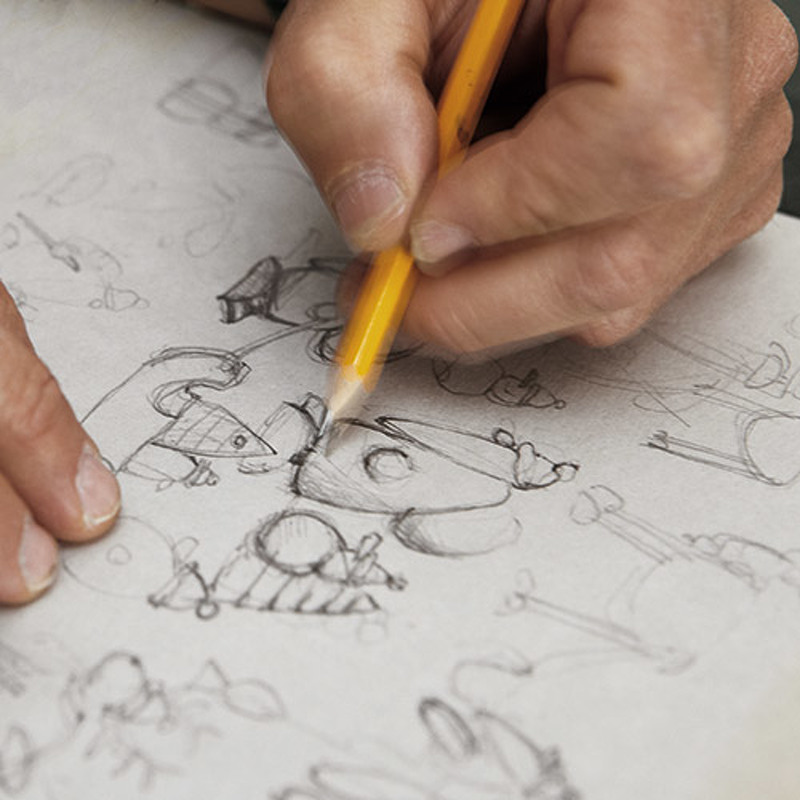 Even today, the product range, the brand and its success are based on uncountable figurine designs and drawings that have been handed down through the generations. 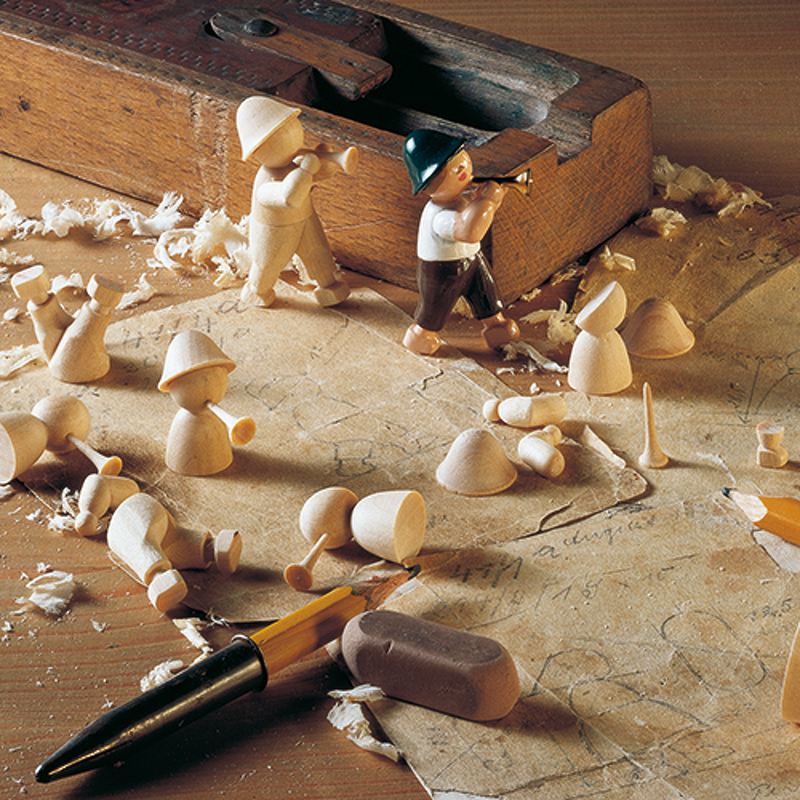 The figurines are still elaborately handcrafted in the workshops in Grünhainichen, just as they were 100 years ago, since the company can only uphold its standards for authenticity, superior quality and masterful craftsmanship by making the items in the very place it was founded. True-to-pattern production according to the original designs of the creators takes top priority at Wendt & Kühn, and gives the figurines their unmistakable character, an expression of comeliness, aesthetics, tradition and exclusivity. 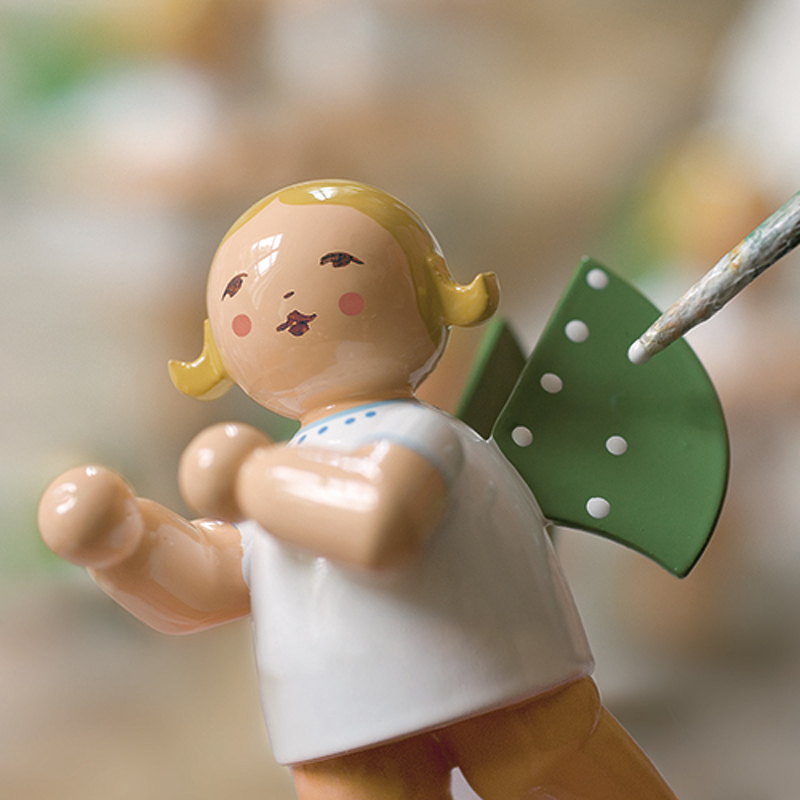 Above all else, the Grünhainichener Engel® angels with the characteristic eleven white dots on their wings are what distinguish the traditional Wendt & Kühn brand. Their nearly 150 different models, most of them as musicians, are known all over the world. 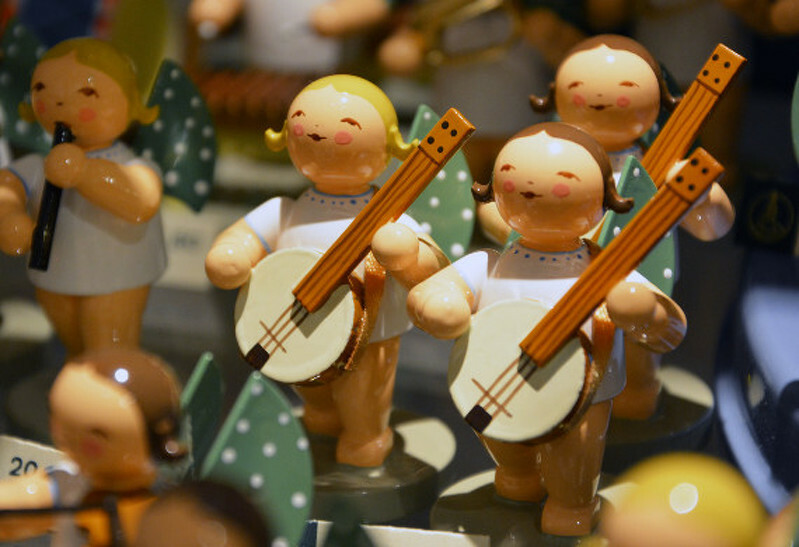 Each individual figurine from Wendt & Kühn is made for enthusiasts who appreciate the exclusive and the extraordinary. 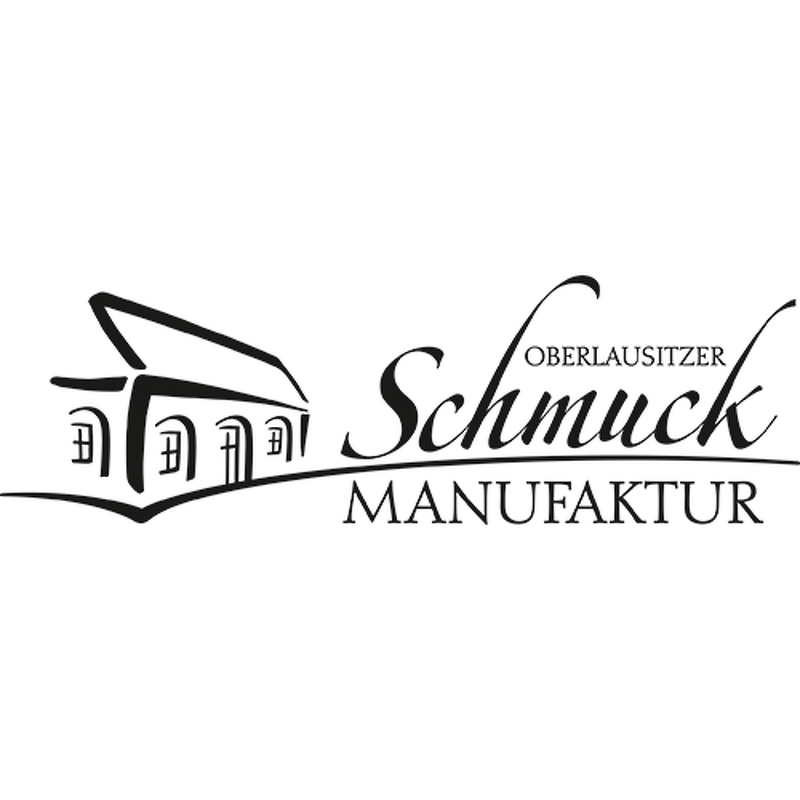 Delicately handcrafted materials, individuality and small but superior jewellery collections is what Oberlausitzer Schmuckmanufaktur in Neueibau, Saxony stands for. 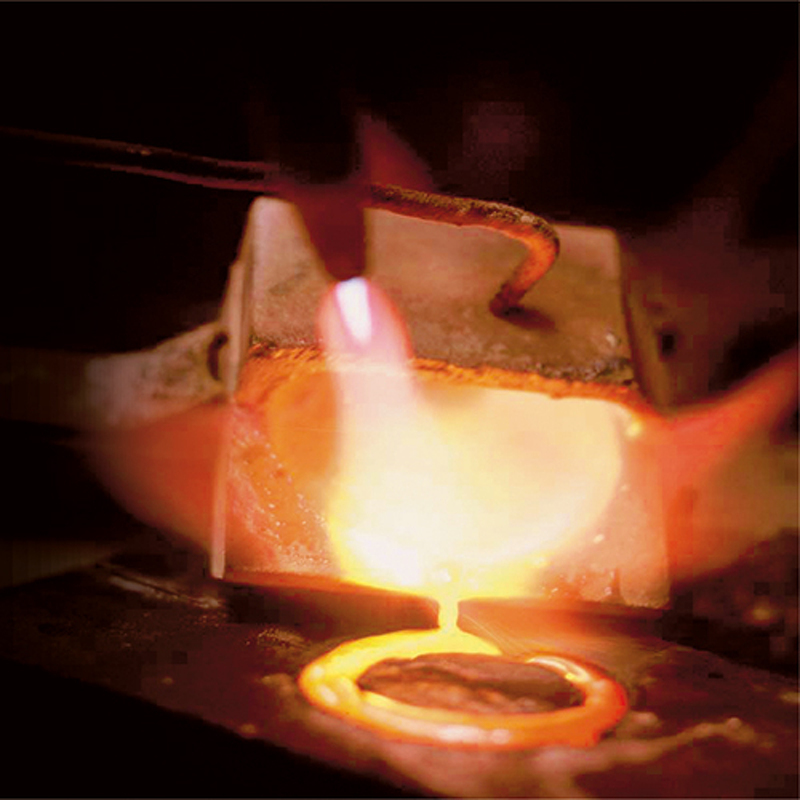 This family business, which was founded in 1979 by master goldsmith Peter Schneider, has been cultivating the tradition of jewellery manufacture for two generations, relying on more than just traditional silver and gold jewellery. 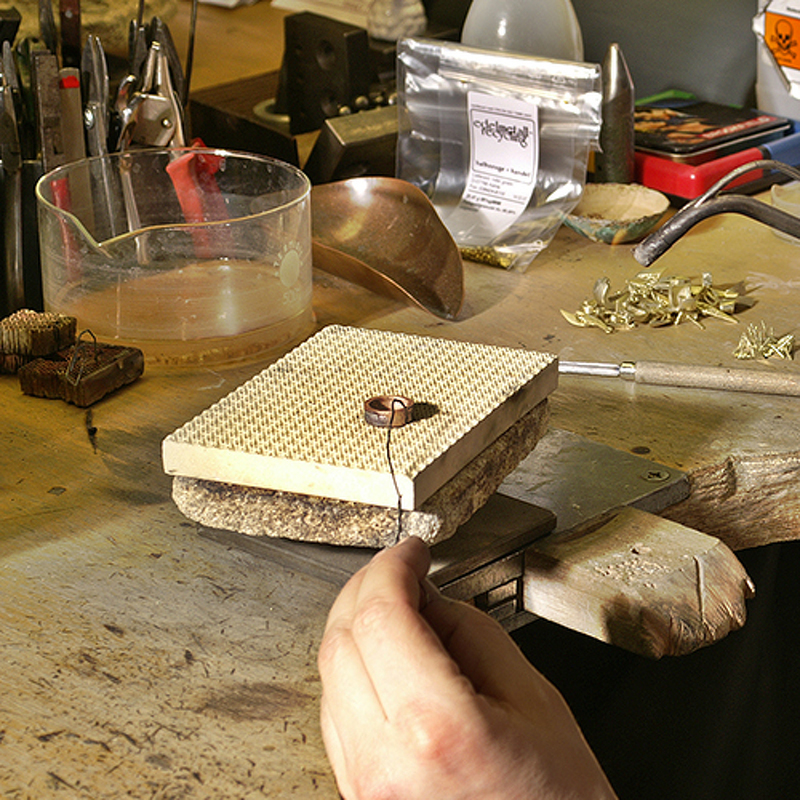 With great attention to detail, it makes both small collections with regional stones, as well as individually designed pieces of jewellery made to order. 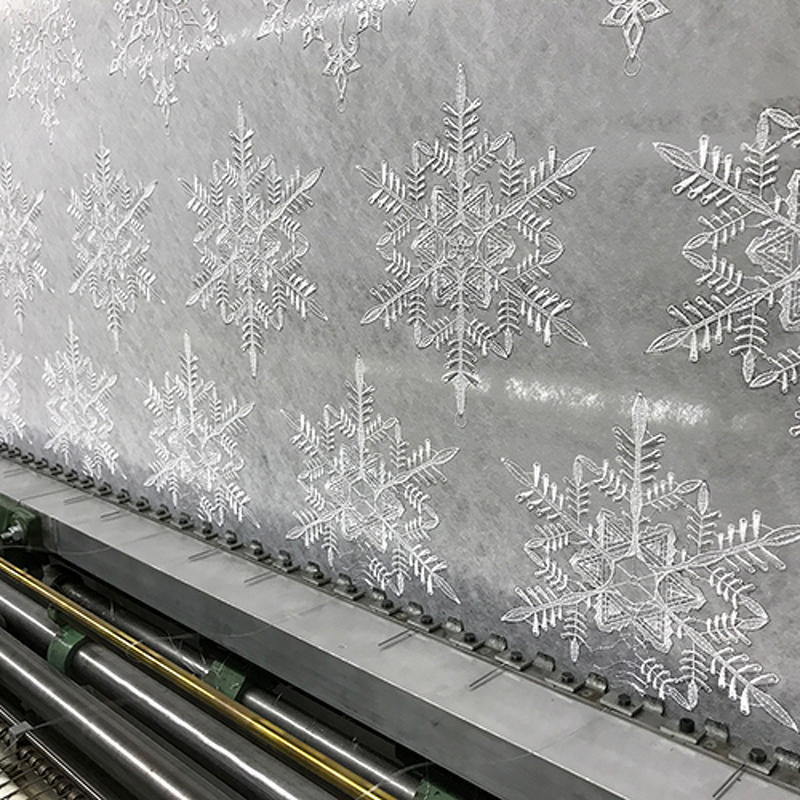 The challenge of creating something out of the ordinary here finds a masterful artist – as is proved by the in-house collection featuring granite from Upper Lusatia. 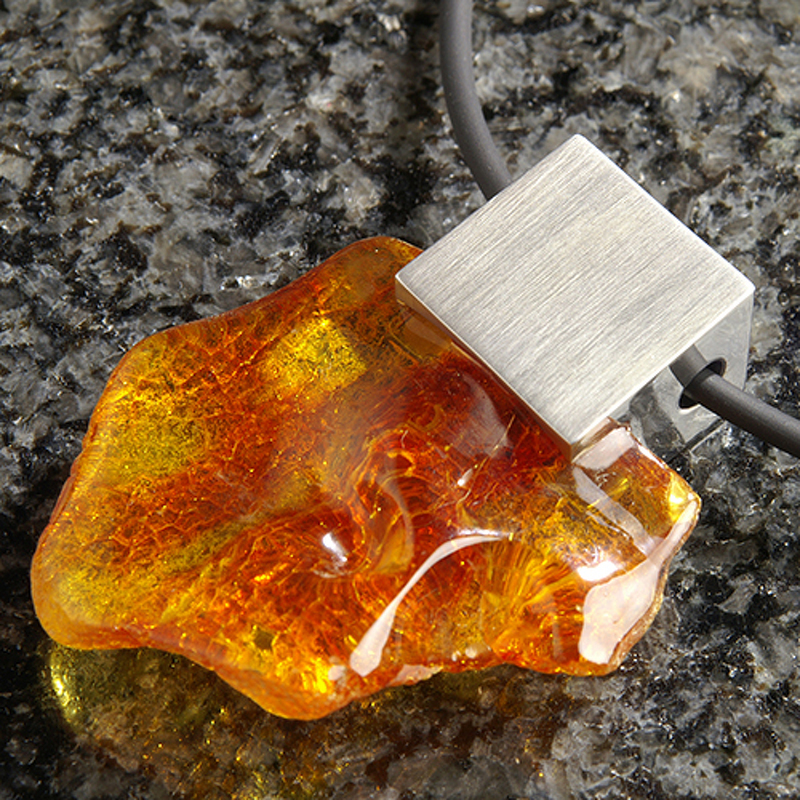 Individual pieces of stone are left in their original, natural state and integrated into silver jewellery, thereby giving the collection a timeless beauty.